Nottinghamshire history > Articles > Articles form the Transactions of the Thoroton Society > Sturton-le-Steeple, Notts. 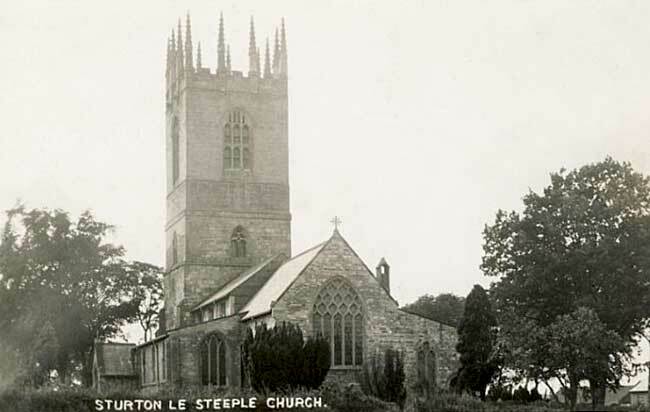 Sturton-le-Steeple Church in the 1930s. AS the monuments in Sturton Church were greatly damaged in the fire which destroyed the greater part of the church on Sunday morning, 24 February, 1901, and the inscriptions on them rendered more or less illegible, it may be appropriate to print and place on record a short account of them and the inscriptions they bore. MATER : OPIS : VIVA : on one side, and PER : TE : SALVETUR : OLIVA on the other. Fitz-Alan, was the eldest of the three sons of Alan Fitz- Flaald (the son of Flaald and grandson of Alan, dapifer Dolensis), the two younger sons being respectively William Fitz-Alan, who died 1160, and who was the founder of Haghmond Priory and the ancestor of the Fitz-Alans, Earls of Arundel; and Walter Fitz-Alan, who died 1177, the founder of Paisley Abbey, and who was dapifer, or steward to the King of Scotland, and from whom descended the royal house of Stewart, or Stuart. But, to return to the Lady Oliva, the daughter of Alan Fitz-Jordan, who appears to have had a younger sister, Alice, the wife of William Espin, who inherited her father's estates in Britanny, whilst Oliva had those in England, and was Lady of Tuxford, Kirton, Warsop, and of Oswaldbeck and other manors. The manor of Oswald- beck Soke was originally a Wapentake, comprising what is now known as the North Clay Division, and Sturton is the chief place in it, and the principal church, and indeed has been called "the Minster of the Clays," hence no doubt the reason it was selected as the place of her burial. She was twice married, first, in 26 Hen. 2, 1179, to Robert de St. John, who died without issue. She married secondly, in the 2 K. John, 1200, Roger de Montbegon, the son of Adam de Montbegon and Matilda, his wife, daughter and co-heiress of Adam Fitz-Swain Fitz-Alric, and grandson of Roger de Montbegon, who held the manor of Thonock, in 1114, of Roger Pictaviensis (of Poictou). Her second husband also died issueless in 10 Hen. 3, 1225-6, when he was succeeded by his cousin and heir, Henry de Munden, or de Montbegon, with whom Lady Oliva had a suit in 1233 respecting Thonock, and in 1236 respecting Hornby in Lancashire. She was a benefactress of the Abbeys of Rufford and Welbeck in her widowhood, and at an earlier date (in conjunction with her mother), of the Abbey of Vieuville (in the parish of Epiniac) for the soul of her father. This slab was the top of an altar-tomb, which was unfortunately removed during the restoration of the church in 1870, and only this portion of it retained and placed in its present position. It is spoken of by Brampton Gurdon, who wrote the History of the Thornhagh Family in 1683, as having been in the "middle of the chancel," where he states Sir Francis was buried. There were portraits of Sir Francis Thornhagh and his wife (Jane, daughter of Sir John Jackson, of Hickleton) at Osberton, according to the catalogue of the pictures there in 1746, but neither of them are there at the present time. There were also portraits there of his father, Sir John Thornhagh, and his wife, Mary, daughter of Sir John Rodes, but only the latter now remains at Osberton. There are, however, portraits of Sir John and Lady Thornhagh at Thonock. Colonel Francis Thornhagh was born in 1617, and having served in the Low Countries under the Earl of Essex, he, on the breaking out of the Civil War, raised and maintained, at his own cost, a regiment of horse for the Parliament, which he commanded, and he was slain whilst leading it in a charge against the Scottish forces at Preston, as already mentioned. He was M.P. for East Retford at the time of his death, which was announced to the House of Commons by Oliver Cromwell, as the loss sustained by the death of "that godly youth Colonel Thornhagh." There is a portrait of him in armour at Osberton, and a replica, which was there also, is now at 2, Carlton House Terrace, London. According to the catalogue before mentioned, there were portraits also of his wife, Elizabeth, second daughter and co-heir of John St. Andrew, of Gotham, co. Notts., and her second husband and distant cousin, William Skeffington, of Skeffington, co. Leicester, but unless they are amongst the unnamed portraits in the gallery, they are not now there. Colonel Thornhagh had a house on St. Mary's Hill, Nottingham, at which and at Rushcliffe Hall, Gotham (his wife's property) he lived ; for his mother had Fenton in dower, and surviving him, lived there till her death in January, 1661. Elizabeth, Frances, St. Andrew, Mary, Sarah, & John. Elizabeth the eldest daur. married Oswald Mozley son of Oswald Mozley. erected this monument in memory of her mother who died . . . . . .aged 80. The date of Lady Earle's death was unfortunately illegible when I copied the inscription some thirty years ago; and there is a gap in the burial registers of the parish from 1683 to 1700, though further on there is one leaf with some burials 1696-1700, and another with burials in 1693-4, but even these are fragmentary, and leave a clear gap of ten years, from 1683 to 1693, within which period it is probable that Lady Earle's death took place; for supposing that she was about the same age as her husband, who was born in 1607, her death at the age of eighty must have taken place about 1687.
the late SIR GEORGE SAVILE Bart. for his long and faithful services. In the Senate he was DILIGENT, DISINTERESTED, & INCORRUPT. He died 17th May, 1787. This John Thornhagh took the name of Hewett by Act of Parliament in 1756, on succeeding to the Shireoaks estate, co. Notts., under the will of Sir Thomas Hewett, Kt., to whom he was in no way related. He had married, 23 July, 1744, at St. Anne's, Soho, Westminster, Arabella, elder of the two daughters of Sir George Savile, seventh Baronet, of Thornhill and Rufford, and elder sister and, in her issue, co-heiress of Sir George Savile, eighth and last Baronet, who died unmarried, January, 1784. She had, with a son who died when eight days old, three daughters of whom one only lived to be married, and she died at Rufford, 13 September, 1767, and was buried here, as mentioned in the inscription. Her husband, who was High Sheriff of Notts, in 1746 and M.P. for the county 1747 to 1774, died, as stated, on the 17 May, 1787, and was succeeded in his estates by his daughter, Mary Arabella, wife of Francis Ferrand Foljambe. (1) The correct blazon of the label should be azure. (2) See tail-piece on page 97.